www.rockproducts.com ROCK products • July 2018 • 37 Case in Point: Mosaic Four Corners Mining phosphate rock from more than 200,000 acres of company-owned land in central Florida, the Mosaic Co. is a leading producer and marketer of concentrated phosphate and potash. The company's products are processed into crop nutrients and then shipped to major agricultural centers around the world. Four Corners formerly operated on a rudimentary mesh net- work running at about 900 MHz. Its standard point-to-point radios had very low bandwidth, and were spaced up to a mile apart. This resulted in frequent network communica- tion breaks, which slowed operations and delayed phosphate production. Additionally, Four Corners' phosphate production is depen- dent upon draglines, which are constantly in motion, and come with a high capital cost. Actively monitoring dragline operations via ruggedized cameras can minimize costs and user error, but with its low-bandwidth network, Mosaic Four Corners could only support two cameras, making it difficult to pinpoint problems or failing procedures. To improve the Four Corners communication network, Mosaic partnered with Rapid Systems, a full-service provider of wireless solutions. Rapid Systems implemented Rajant Corp.'s kinetic mesh network, a type of wireless network that has been successfully deployed in other mining facilities. When Mosaic initially tested Rajant's network for production control, the mine quickly saw an increase in efficiency and phosphate production, allowing Four Corners to add more functionality to its pumping systems, make remote program changes and create better processes. 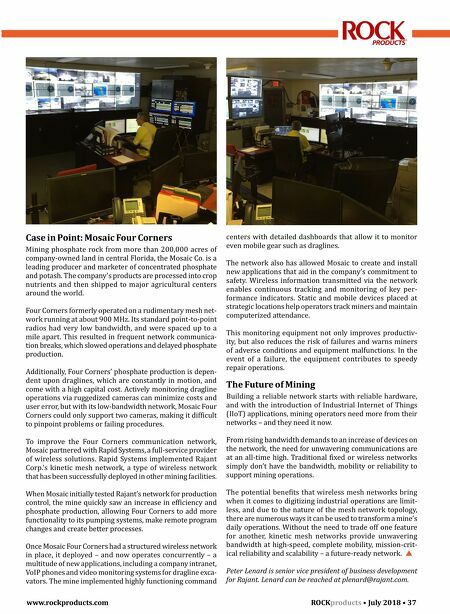 Once Mosaic Four Corners had a structured wireless network in place, it deployed – and now operates concurrently – a multitude of new applications, including a company intranet, VoIP phones and video monitoring systems for dragline exca - vators. The mine implemented highly functioning command centers with detailed dashboards that allow it to monitor even mobile gear such as draglines. The network also has allowed Mosaic to create and install new applications that aid in the company's commitment to safety. Wireless information transmitted via the network enables continuous tracking and monitoring of key per- formance indicators. Static and mobile devices placed at strategic locations help operators track miners and maintain computerized attendance. This monitoring equipment not only improves productiv- ity, but also reduces the risk of failures and warns miners of adverse conditions and equipment malfunctions. In the event of a failure, the equipment contributes to speedy repair operations. The Future of Mining Building a reliable network starts with reliable hardware, and with the introduction of Industrial Internet of Things (IIoT) applications, mining operators need more from their networks – and they need it now. From rising bandwidth demands to an increase of devices on the network, the need for unwavering communications are at an all-time high. Traditional fixed or wireless networks simply don't have the bandwidth, mobility or reliability to support mining operations. The potential benefits that wireless mesh networks bring when it comes to digitizing industrial operations are limit- less, and due to the nature of the mesh network topology, there are numerous ways it can be used to transform a mine's daily operations. 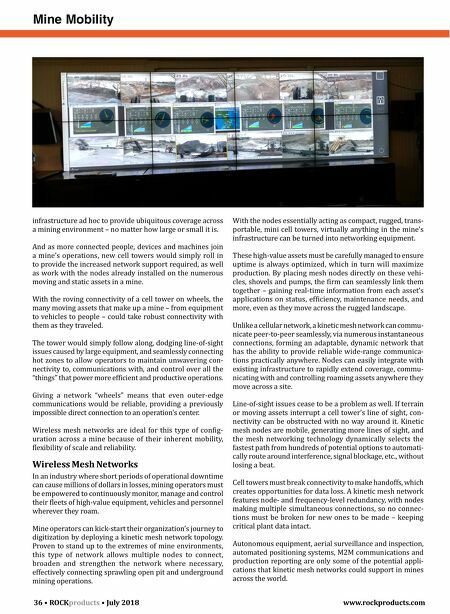 Without the need to trade off one feature for another, kinetic mesh networks provide unwavering bandwidth at high-speed, complete mobility, mission-crit- ical reliability and scalability – a future-ready network. Peter Lenard is senior vice president of business development for Rajant. Lenard can be reached at plenard@rajant.com.